Ascension Tree Essences are a set of eight flower essences made from trees, by Antera and Omaran, under the guidance of Archangel Metatron and the Council of Seven, channeled by Antera. The essences are for lightworkers, or people who are on a spiritual path of Light, to facilitate the process of mastery and ascension, and to help us open to the higher frequencies that we are now being challenged to incorporate into our bodies, minds, and souls. "These essences are a physical aid for those people who want to speed up the acceleration of the frequencies in their cells, and in all of their systems; so they can be at the forefront where the action is, and be the leaders, healers, and teachers of the world during the next few years... few decades even. And these essences will enhance the healing skills, the telepathic skills, the channeling skills, and the well-being in every regard of those who use them." Antera and Omaran were guided us to particular trees on sacred Mt. Tamalpais, which were blessed with a Divine Dispensation. The blessing enhanced the energy of these trees, adding qualities and frequencies that have not been available on the planet before this time. The production of the essences is overseen by a group of Ascended Masters, Archangels, the Devas (angels) of the trees, and the Angel of Mt. Tamalpais. The Deva of each tree was contacted and clear information was given about what specific gift was being offered. In the process of making them, the essence, or higher 'ethereal' expression of the tree is imprinted into pure water. This charged water is then preserved in brandy, and further enhanced and stabilized in a sacred medicine wheel ceremony. Many people confuse flower essences with aromatherapy or oils, but they are quite different. Flower essences do not smell, but enter the body directly by taking a couple of drops diluted in water. They act on the electrical body systems, thereby affecting the physical, emotional, mental, and spiritual bodies. Only very small dosages are required, for their non-physical energies are what is taken. 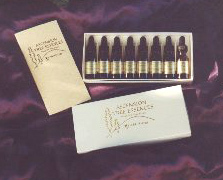 This boxed set contains eight essences, each in a 1/2 oz dropper bottle. A pamphlet is included, that describes in detail what each one is for and how to use them. They are listed in the column to your left.